Baked ziti is one of my favorite easy vegetarian dinner recipes of all time. It takes just a few minutes to throw together into a dish and toss into the oven. In about half an hour, dinner is ready! Even better, with a smaller family, there are almost always leftovers for lunch the next day. For larger families, this is a cheap meal that’s super simple to stretch even further just by doubling the recipe. 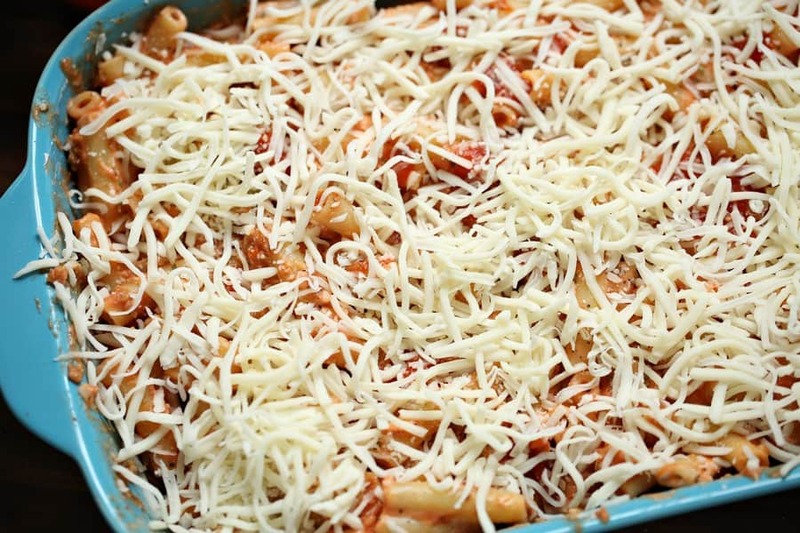 My grandmother used to make baked ziti to feed our massive Italian family during parties. Check out our video tutorial, then read on for how to make this insanely simple dinner recipe. When you’re done, print out the recipe card so you can whip it up whenever you want! Cook pasta, drain, then pour in casserole dish. Mix ricotta with half of the mozzarella cheese and spices. Combine ricotta mix with pasta, add marinara sauce, then mix that. I love to sprinkly my baked ziti with plenty of Parmesan cheese, so you might want to add some of that to the dinner table. I know, there’s already plenty of cheese in it, but honestly, I add Parm to just about everything! You can never have too much cheesy goodness! This recipe pairs perfect with a side salad. My gran would always make up a huge bowl of salad and put it on the table, along with some fresh bread. That’s really it! The ziti itself was filling enough that we didn’t need a ton of sides! Looking for some other easy vegetarian dinner recipes for the rest of the week? Check out a few two more of my favorites! 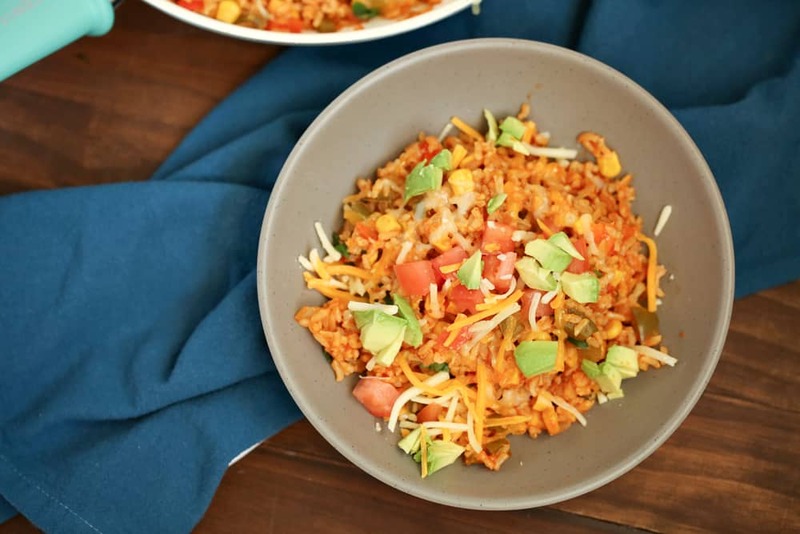 This Taco Skillet Recipe is a delicious meatless spin on taco Tuesday! 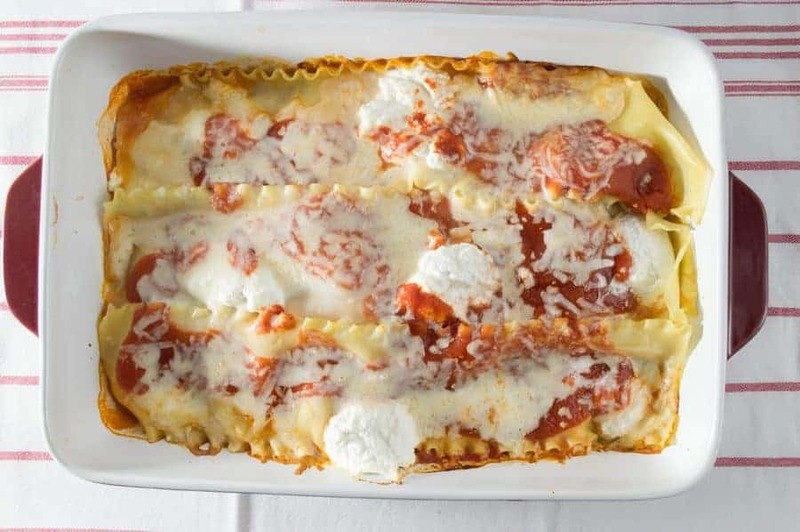 Another yummy Italian classic like grandma used to make, this Eggplant Lasagna Recipe! is so filling and delicious! Don’t forget the garlic bread! Do you have a favorite vegetarian dinner recipe that you love to serve your hungry crowd? Share in the comments! We love pasta dishes like this too.It really looks delicious. Looks so delicious and would be a big hit in my family.Can’t wait to try it. Delicious! Pinned! Thanks for sharing at Funtastic Friday! That looks really delicious. It is something way better and different than the everyday spaghetti dish. I would love to try this. This looks so delicious! I can’t get my husband to eat vegetarian dishes normally, but he may make an exception for such lovely pasta! This looks so yummy! We are huge pasta eaters in our house and so this is definitely going on my to-make list. Wow does that ever look tasty. I have yet to make baked ziti but I know my kids would love this. I will have to make it for them sometime! This looks like a scrumptious dish. I really like your well laid-out instructions. I love this vegetarian version! It looks SO good! A perfect weeknight dinner! we are vegetarians so this is the kind of baked ziti we make at least once a week- we also love vegetarian chili and pasta primavera! Thanks for sharing your version! 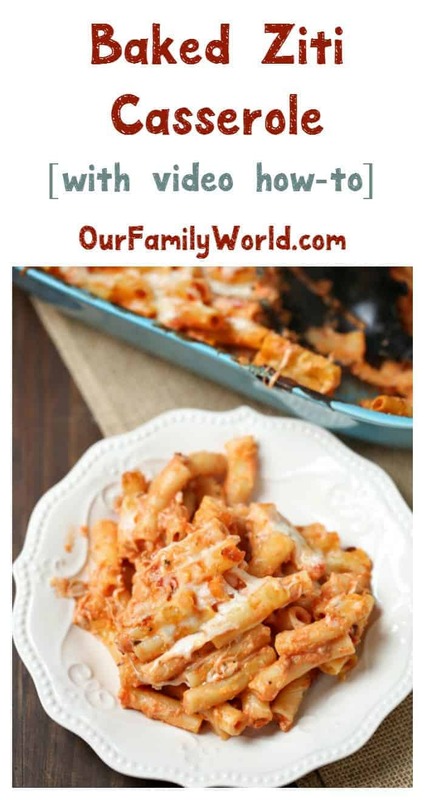 This baked ziti recipe looks so delicous and easy to make. I know it will be a big hit with my family. We try to have pasta at least once a week. 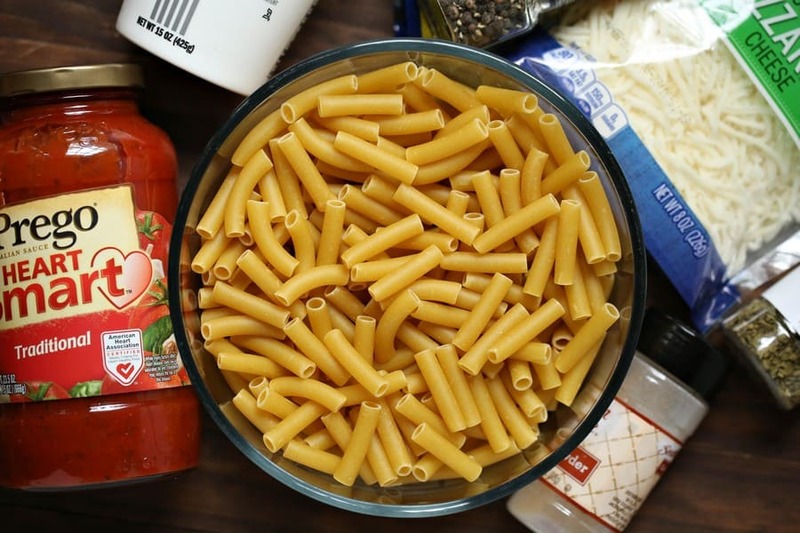 This veggie ziti dish looks like a must try real soon! Yum! I need to start making dishes like this for myself. 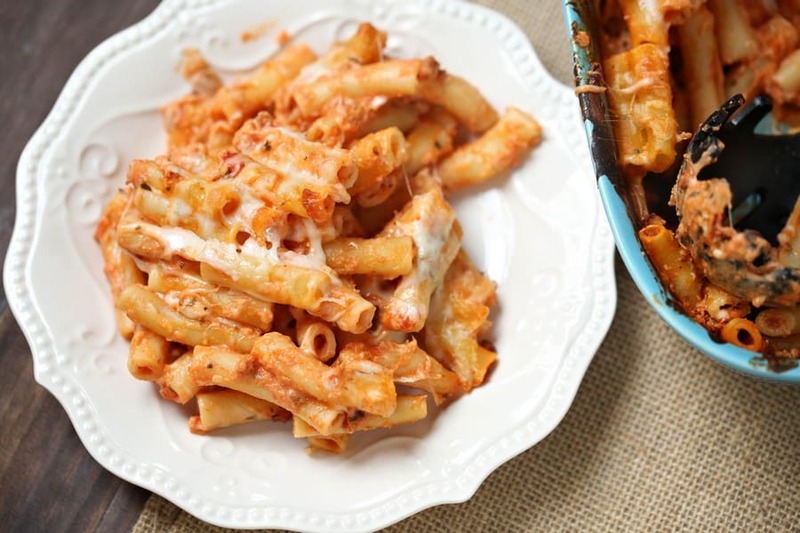 This baked ziti sounds amazing! This looks so good. My mom used to make the best baked ziti ever. I love pasta bakes so much! They’re so easy to make and they are filling, plus the whole family likes them. FREE Halloween Party Invitation Printables! What Do You Do When You See Parents Who Don’t Put Their Tots in a Car Seat?